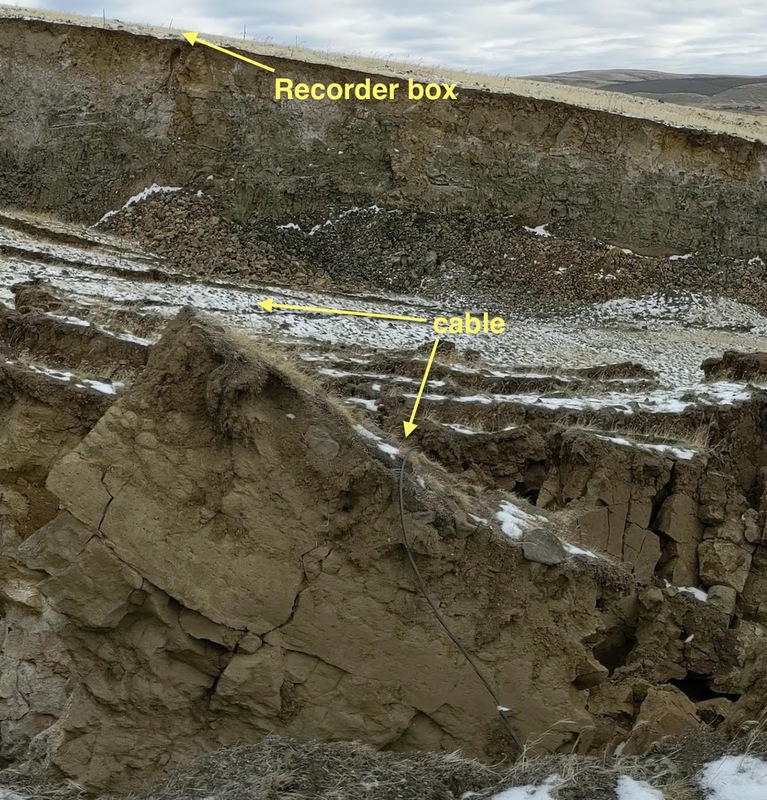 Previous detailed reports of an active landslide on Rattlesnake Ridge, near Union Gap just south of Yakima, WA started almost a year ago on Dec. 30, 2017 "Seismic Monitoring of a Slow Landslide" and includes several updates. A following blog, "Continued Landslide Monitoring" started in mid February, 2018 and yet a third on July 9, 2018, "Rattlesnake Ridge landslide slowing down", which also contained an update in early August. There also is a brief report from Amanda Thomas of the University of Oregon who set up a unique array of "Nodal Stations" at the landslide to study the detailed distribution of the tiny events originating there. Because of the huge quantity of data collected the analysis of this data set is still on-going. Since summer very little has changed in the seismic data other than additional problems keeping our stations running. Reports from the geologists and engineers monitoring the landslide with a variety of geodetic and photographic techniques is that it has continued to slow down but at decreasing rates. From the fastest motion of about 1.7 ft/week last spring the maximum motions on part of the slide now is down to about 0.8 ft/week and some parts of the slide are slower than that. During the period of seismic monitoring (Jan 2 to Dec 2, 2018) the average number of seismic events counted by our automated system on UGAP3 (most reliably operating station) increased from an average of about 30 events/hour early in the sequence to an average of 80/hour in the period of mid-Mar - early-May and then started decreasing to a rate of less than 40/hour by mid-Sep. It has been stable at this rate since then, which makes us think that this may be near a threshold where other noises (wind, vehicle traffic) are being counted instead of only landslide related events. A quick perusal of raw seismograms yields a qualitative confirmation of there being significantly fewer tiny, sharp and short events on the records recently than there was in the late summer. Here is a plot of the output from our automated event counter for the whole period. UGAP3 is the red line which worked well during the whole period; however is located near the top of the slide and away from the part that seems to generate the most events (near UGAP5 and UGAP6). Unfortunately these two stations have had several technical problems and so do not have continuous records. Note that UGAP5 (green) has consistently had the most detected events (as much as ~200 events/hour early in the sequence). UGAP6 located nearby but out on the slide block mimics the rate of UGAP5 after early April. As reported in the early July blog, UGAP5 had its instruments cable chomped by some sort of animal and thus stopped working. It was repaired in mid-August but then stopped working again at the end of Oct. UGAP6 had failed on Sep. 12 so for the last month only UGAP3 has been working. Because our technical staff has been very busy with other PNSN stations and the landslide didn't seem to be changing much we did not try a repair trip this fall. When UGAP3 failed on Nov 30 we decided that it was time to pull everything out and terminate this seismic experiment. Of course the slide is still moving and is still being monitored geodetically. Should we get reports of significant changes in its motion we are prepared to re-install instruments to again monitor it seismically. And now for some interesting photos of the slide and our instruments. 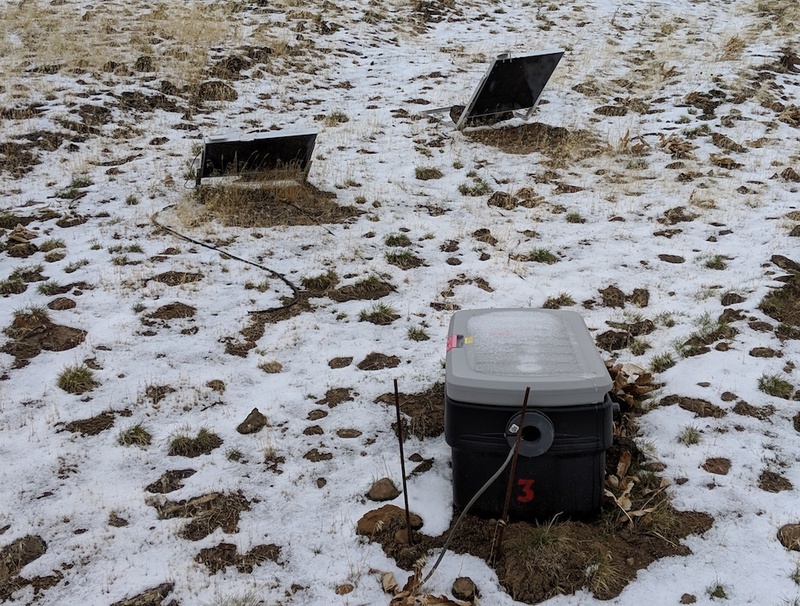 Our hot-shot field crew of Doug and Dave recovered our instruments yesterday, Dec. 4 and discovered the reason our stations have been failing. Similar to the previous failure of UGAP5 both it and UGAP6 failed because of cut cables. In fact the UGAP5 sensor cable was cut in more than one place and the entire sensor at UGAP5 was yanked out of the ground. 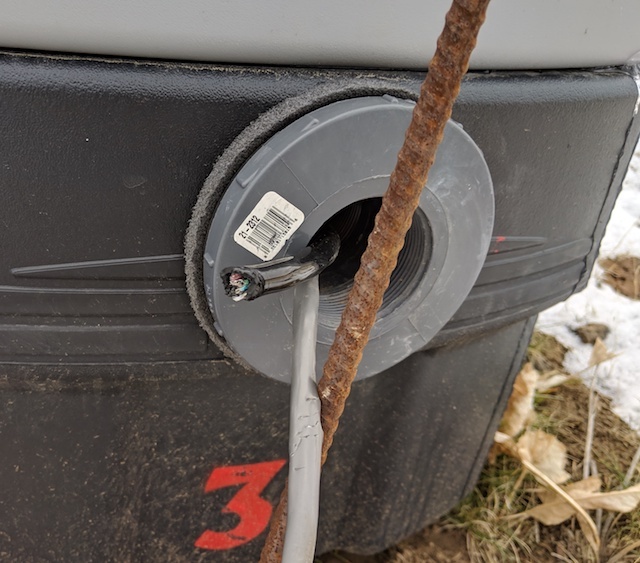 Here is a closeup photo of the UGAP5 sensor cable (black) as it left the equipment box. Note the grey cable (sensor cable to UGAP 6) has been nibbled on. It seems the power cable to one of the solar panels at UGAP3 was similarly chewed and cut so this unit slowly ran out of power stopping on Oct. 30. The long cable between the equipment box and the sensor for UGAP6 out on the landslide block was also cut. However, in its case the culprit was a rockfall from the 10-12 meter scarp down which the cable went. Here is a photo taken from near the UGAP6 sensor back along the cable toward the recording box. Note the rockfall directly below the recorder. It was too hazardous to approach the rockfall area to check it out in detail so the cable was abandoned. We probably cannot blame this cable failure on some rogue, chomping animal but the other cables cuts we can. We suspect, based on the chew marks, cleanlyness of cut, heavy sensor ripped from the ground and similar animal problems we have had at Mount St Helens that the animal is a deer or elk. We did fail to take the preventative measures of burying the cables or wiping them down with isopropyl alcohol. Also, maybe the solar panels being tipped over at UGAP5 (see photo below where the panels are now facing down and toward the camera) can be blamed on the same animal but more likely is due to strong gusty winds breaking part of their support. They were well weighted down by large rocks but their angle brackets holding them facing up and to the south were broken. And finally to give one a sense of the changes that have taken palce over the past year we show three panorama photos, all taken from near the same spot at UGAP5 looking out over and down the slide block. Acess to the slide block from the east is no longer possible because of the size of the scarps. Our brave crew had to climb up through the quary on the west side to recover the UGAP6 sensor. Thus, unless we hear from the geologists that the slide is speeding up or otherwise changing this ends our seismic adventure of Rattlesnake Ridge.